The Golden Geese love nothing more than a friendly visitor, especially when the visitor in question has four legs, a waggy tail and a lovely snuffly nose. We are of course describing Brando Mott, the extremely handsome canine son of the legendary journalist, Joe. 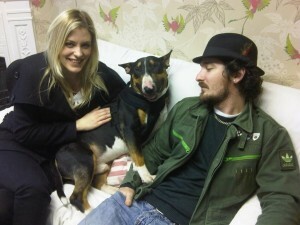 Brando, Joe and Joe’s very gorgeous lady Laura popped in for a cup of tea and a catch up with the team. It turns out that Joe and Laura are helping rescue dogs by walking them every Monday and Joe is busy getting active with some of the UK’s leading canine charities. It is one of GGPR’s ambitions to work with a pet brand and with friends like Joe, Laura and Brando we are sure we can do a lot of great work! If any brand managers would like to be our pedigree chums, please contact laura.hind@goldengoosepr.com!